Crudely painted stenciled signage from the relatively new Mumbai local trains. 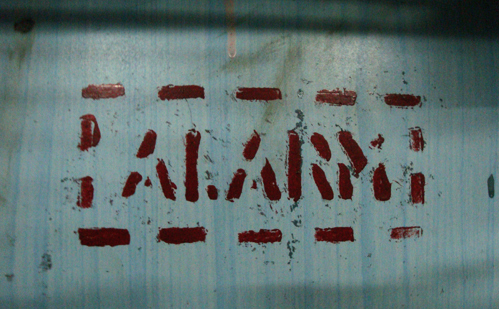 The 'Alarm' sign inside the compartment is pretty legible, but do the same in Marathi, and suddenly it is more difficult to read especially because it's partly scratched off. I can figure out the first and last word, it says apatkaleen (something) uplabdh. Then the arrow points to the footboard of the compartment door. A real puzzle, typical of the Indian government or should I say Railway authorities. I can guess it means 'In case of emergency (aapatkaleen) use this (uplabdh)' then the arrow pointing to the footboard. God only knows what it's supposed to point to. It's an excellent example of the typical contradictions you face everyday in Bombay. The new trains have this cool new speaker system which announces the nearest station in three languages, and at the same time the emergency help services and signage are at this level.